I remember before supermarkets and sliced bread in plastic bags, hot, fresh bread was delivered, unsliced of course, by the baker in his horse and cart. It may be a trick of nature, but it doesn’t seem all that long ago that the baker’s horse, a large, gentle creature that needed no guidance and was loved by all the neighbourhood children, would slowly clip-clop up and down the street, following the baker on his daily round. I may be remembering the scene through a child’s eyes but life seemed so much more innocent, simpler and slower back then. 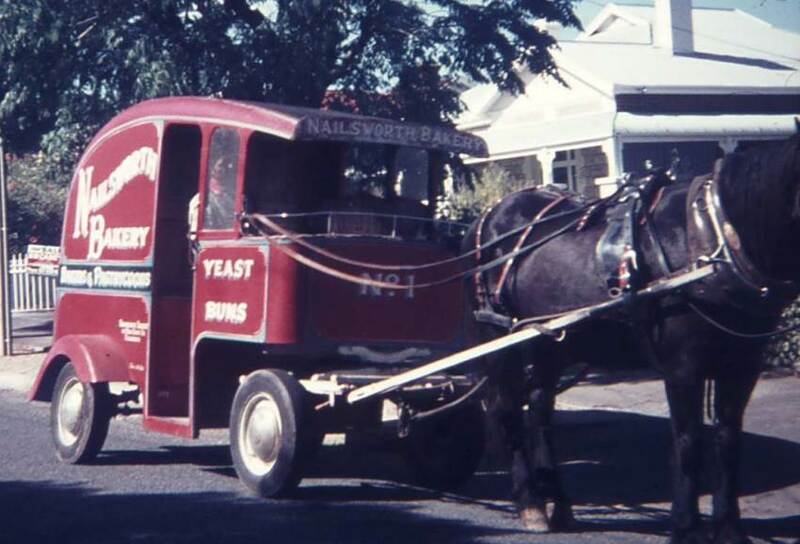 Nanette Mazey shared a photo and a memory of growing up in Adelaide while bread delivery was still by horse and cart; “This was take in the early 70’s in Alpha Road, Prospect. I can’t remember how often they used to come around.” Great photo Nanette, thank you! The baker’s cart was always brightly painted, with the name of the bakery painted on the side while the interior was lined with wooden shelving on which sat perhaps hundreds of loaves of crusty bread, all baked fresh that morning. The delivery man’s only tool of trade (aside from his knowledge of the round) was the large wicker basket, into which he would place the hot bread and cover with a clean white linen cloth. Each morning the aroma of fresh bread would fill the street along with the smell of the horse and occasionally the odour of a large steaming heap of horse dung, an extra bonus for dad’s vegie patch. The horse seemed to know exactly when to stop so the baker could refill his basket as he ran from house to house, delivering a loaf or loaves into a bread tin, left on the front veranda. During school holidays all the kids in the neighbourhood would wait at the end of the street and a lucky one would be chosen to hold the reins of the old horse as he slowly meandered along the road. Sometimes too there would be a fresh yeast bun from the basket for the children waiting patiently for their turn. It’s sad to think that in this day and age the baker would probably be under suspicion for some crime for touching a child as he lifted him/her into the seat behind the horse, plus there would be the possibility of litigation should a child happen to fall or be in any way injured. From memory the bread man came every day as bread back then had no preservatives and after just a day or so would be stale. That’s when mum would make her bread and butter pudding with raisins, served with hot custard….I can almost taste it now! As far as I’m aware bread delivery by horse and cart continued on in some Adelaide suburbs until the 1970s. Gradually though the horses were replaced by bread vans which also eventually disappeared from our roads and now most people simply purchase their bread from a supermarket. Do you remember the baker delivering bread in his horse and cart? My sister met her future husband when her motorbike broke down and the baker came by with his horse and cart and stopped to help her. The horse wanted to keep walking, it took a bit of persuasion to get the horse to stop. I lived next door to Jacksons Bakery as well … between 1963 and 1970. I’m wondering when you lived there? My parent’s cottage was No. 35 Coglin Street and it went right through to Hocking Street where we usually hung out and played. I went for a walk through that area today and now I’m looking up some photos online. Parkers were still delivering bread from green horse-drawn vans into the 70s in South Plympton when I was in high school. Frank would let the kids pat Roany, his usual horse, but not the chestnut ex-trotter who was the occasional substitute – he didn’t think he was trustworthy enough. When Tip Top took over the bakery and switched to vans Frank didn’t stay much longer I think he really missed slower pace with time to talk to people, and missed the horses too. I remember the bread man, I think it was Lovells bread. I remember one day while the baker was delivering the bread to a house, me & another kid hopped onto the cart, picked up the reins & said to the horse gidyup, the horse looked around at us as if to say…….get lost you kids, I move for no one but my handler, the baker. I grew up in Norwood & we loved having fresh bread every day there were about 15 to 20 kids in and around our street & Vegemite or Fritz & sauce sandwiches were the Favourites, we also had Fresh Milk by the Billy Full & the Rabbit Man with The Bunnies Hanging over the sides of his cart ready to skin would also be regularly delivered ……… Those were the Days !!!!!! Still love Roast Rabbit. My dad Rex Simmons used to deliver bread for Lovellls Bakery, he used to tell stories when the horse would take of back by it’s self to the stalls for s feed. The horses never got lost, eventually he moved to a Buttercup van. I spent days with him when I was s kid doing his runs. Thanks Bob Byrne, for helping us to relive days gone by, as you said, it seems like yesterday these events took place. I even remember the bakers name, it was Kevin, if my memory serves me correctly Kevin ended up in management for, (I think Lovells). great memories as a kid growing up. Saw a bread delievery cart on one of my families walks in a poor state, it is a Nanto cart.Does anyone have any info on it. It would be wonderful to restore for the local Adelaide community. Cheers, Henry. Confession time….I was the kid who would open your milk bottles on your front verandah while you were asleep and i would LICK the cream off the foil lid…..And then put the lid back on…….OOOHHHhh back in the Good Old Days……. Is my memory play tricks on me? Maybe… However I seem to recall catching the first bus home from town one morning in the early 1980s , and in one of the side streets leading onto Payneham Road in the St Peter area, there was a horse drawn milk cart and milkie doing their round. Can anyone confirm or correct me on this? If I am correct, this surely would have been the very last horse drawn delivery service of any kind in the suburbs – apart from the brewery ( Coopers? ) that ran a horse drawn delivery service around the Adelaide CBD. Yes,we had bread vans,fish mongers and butchers,all with a home delivery service..in allemby gardens,coombe road,just around the corner from Hallett’s bricks mansion on grange road,that’s prince Alfred college Hallett brick company people,say hello Gary and terry,that’s a beautiful cigar Mr hallett,sitting in that bronze gold holden ht premier,in the back paddock,full of three corner jacks..where the hell is that beautiful Hallett mansion,lameys has gone as well in lockleys! I lived in Milner St, Prospect until ’73. I was talking with a Customer who remembered horse and cart delivery and I said I did too. I then randomly searched for it and found this page! My memories of the exact year are not specific but I do remember that horse and cart and as Alpha St was only 6 Streets over there is a good chance it is one and the same. I lived in Abbotsford & Northcote in Victoria and remember the Bakers horse & cart, from memory it may have been painted in green & gold with lovely script. Also in those days the milkman. ice cart man, fruit man & night man also used horse & carts of some style.Not sure about the ‘night man’ as I never sighted them. We also sometimes opened the cardboard like tops from the milk to get some of the cream from the top. Going to the shop with a billy for milk we also swung it around in a circle- sometimes having to explain how some milk managed to spill out. on holidays at Xmas we camped along a river. The farmer who milked the cows over the river would row over early in the morning & fill your billy then hang it from hooks on the big shade tree, You left your money in the empty billy the night before. Never heard of any money being stolen over night. Leave a Reply to henry Click here to cancel reply.